It has been an extremely exciting and educational 3.5 months since I started my slow carb experiment by following The 4 Hour Body diet. My ultimate goal was to get in the best shape of my life, which I defined as being in equal or better shape than I was about 6 years ago before I injured my back and had my second shoulder surgery. 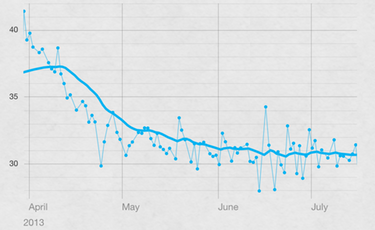 I started at 201lbs with a goal of dropping down to 186lbs, ideally losing no muscle mass. I also wanted to be able to surf, run, lift or do pilates every single day without signs of fatigue, reduced alertness or negative effects on my sleep. In terms of exercise, I’m getting about an hour of exercise 6 days a week, with 2+ hour surf sessions when there’s good surf around SoCal, without any problems whatsoever. I’m full of energy, sleep like a baby and feel like I’m able to perform at my optimum level in most things I do, which is an amazing feeling. What were the big lessons? First of all, awareness was key. Using the Withings Smart Body Analyzer Scale made a huge difference in understanding my body. I weighed myself every morning at the same time, which gave me immediate feedback on how my behavior had influenced my body weight and fat%. The scale is not perfect and fat% can vary quite a bit depending on the amount of water/waste you have in your body, but it gives you an idea of the trend, which is the most important thing. I also used Nike+ FuelBand and Nike+ Running to keep track of my general activity and my runs, which proved to be hugely motivational and behavior forming. Having people around me who were going through similar experiences and using similar tracking devices was extremely useful. Being able to share information, celebrate achievements and get support when I needed it made me feel part of something bigger and that was instrumental in my success. And last, but definitely not least, I realized how essential nutrition was to one’s wellbeing. Losing and maintaining weight is 80% nutrition and 20% exercise in my opinion. I had weeks when I exercised very lightly because of injuries and to my surprise, it had very little effect on my body composition. I stuck to the slow-carb diet very closely: which mainly consists of meat, veggies and legumes. However, I have to confess that I didn’t follow the diet to a tee. I kept having my daily lattes, with honey, an occasional bite of dark chocolate and a couple glasses of red wine too many every now and then. 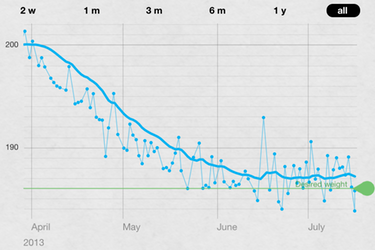 I also went on a couple of epic cheat days, one of which resulted in a 16lbs body weight difference over three days. However, none of this seems to have affected the final result. One of the big lessons from this experiment is a much bigger focus on my nutrition which is a life long quest I’m really looking forward to. Original motivation behind this experiment was to start eating our own dog food as early as possible. We’ve been working on a wellness app for the past 5 months and I feel that my experience combined with Ben’s (Vimify co-founder) who’s been on a similar journey has given us a much deeper insight into the product, which will hopefully turn into a vastly more engaging experience for our users. We are incorporating these learning into the next iteration of the product, which we’ll release into a limited beta soon. You can sign up if you’re interested in getting early access (spaces are limited). I enourage you to experiment and find your ideal diet and exercise regime. It will make your life a bit brighter, happier and definitely more fun!